Cake decorating for weddings is my specialty. 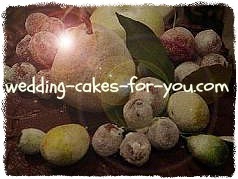 If you have questions about baking, decorating, constructing, storing, delivering, or setting up your exquisite creations then you are at the right website. Wedding cake ideas from an award winning cake decorator and from readers like you are here to help. Ideas for decorating wedding cakes can be as simple as a plain buttercream cake with fresh flowers to a complex sugar art design. I have been embellishing wedding cakes for over 25 years. With requests from the very simple to the very complex there is a wide range of ideas to share with you and hopefully spark your creativity. 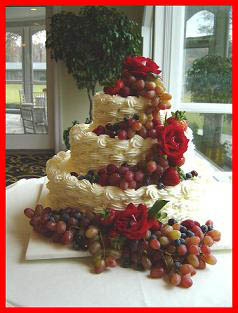 Feel free to share your ideas on cake decorating for weddings. Go to the contest page if you would like to share your talent with us! Today's exquisite creations come in many guises. They can be decorated with sugarpaste, shaped into packages or created from many tiers of cheesecake, cupcakes or literally any sweet that you fancy. 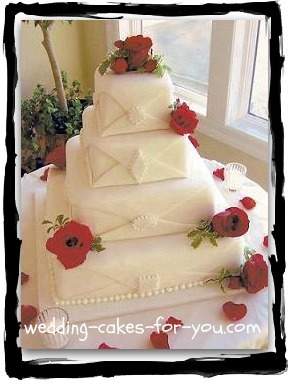 Click the photo to go to more fondant wedding cake ideas. The video will show you how to basketweave with frosting. You can then see the finished basketweave creation in the frosting fruit video below. It's a Christmas cake for Salisbury Breads a local bakery that specializes in amazing gourmet food. If you would like to see a picture tutorial on basket weave then click here. (1 egg white) in a bowl, mixed lightly with a fork until frothy. Castor sugar in a bowl for sprinkling over the fruit. Brush the fruit with the egg white with a pastry brush and then sprinkle the sugar over the fruit, shaking off the excess. Place on a tray which has been covered with waxed paper to let dry. Drying time will depend on the humidity. *These will keep for a few hours-after icing so they must be put on right before the reception starts. Do you have a favorite nut or candy? 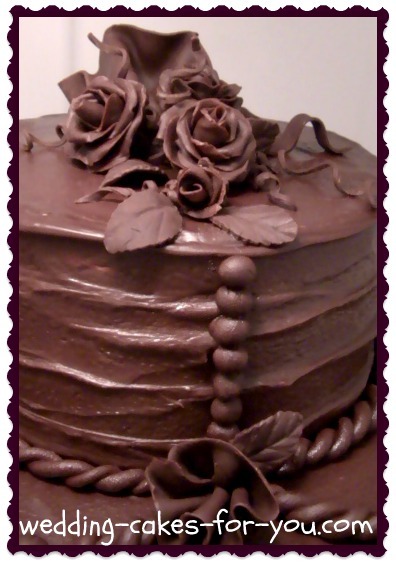 Some candies lend themselves to decoration on a cake. Experiment with some of these. Toasted almonds, pecans, or walnuts. Toasted or fresh grated coconut. Marshmallows-the mums in the photograph are made with mini marshmallows. Chocolate dipped fruit. Strawberries are great for this, but don't limit yourself try a variety of fruits. Chocolate leaves are very easy to make. Click the picture to go to modeling chocolate questions and answers. Buttercream roses and flowers made with buttercream. Royal icing lace and extension work. Small pieces of lace, piped onto waxed or parchment paper, as run outs, attached to the cake when dried. Consider colored dusting powder for the lace. Sugar flowers range from simple filler flowers made with cutters, to fabulous roses, poppies, and sweet peas. * You will need good petal cutters, a kit of tools and a variety of petal dust. These can be purchased at your local craft store or online. 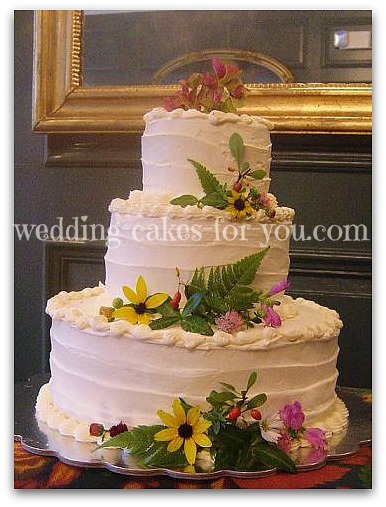 Would you like to learn more about cake decorating for weddings? Check out my NEW eBook. 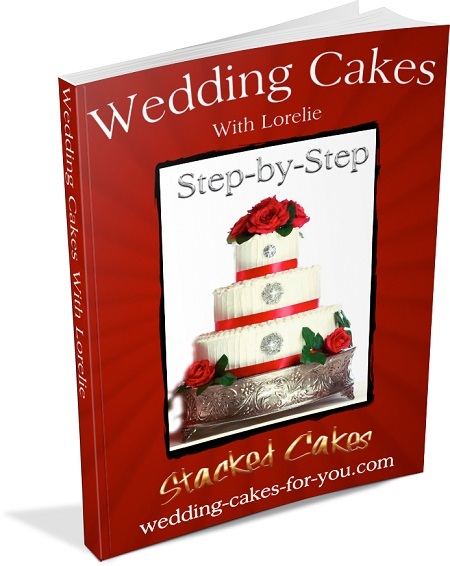 The book includes a list of all tools and supplies needed and detailed instructions on baking, constructing, filling, frosting, decorating and delivering your beautiful creations.